I feel like San Jose is a bit of a black sheep of the Bay Area. It’s fairly spread out and not super cohesive and there are lots of varied pockets. It tends to be a city of suburbs, with some nice and some decidedly not-nice areas. So it often gets overlooked when it comes to stuff to do. I was feeling a lot of this when we first moved to the area. It didn’t seem like it had a lot of character or commitment, but I determined that I would find some excellent spots and grow my love for the city by doing so. It turns out there are quite a few really fun and unique activities in San Jose. Enjoy and let me know if you check any of them out! Beethoven Center at San Jose State University – Some exhibits (including a lock of his hair!) and some concerts, as well as an annual Beethoven Birthday celebration. California Theater – Opera San Jose plays here and it’s lovely, as does Symphony Silicon Valley. City National Civic – Fun performances. I wish I’d known sooner that the Piano Guys would be there or I would’ve loved to go! Downtown Ice – Fun to go ice skating in the colder months! Emma Prusch Farm Park – there’s a darling little farm and a great playground with plenty of room to run. And FREE! They have different festivals throughout the year (such as pumpkins in the fall). Greek Festival of San Jose (at Greek Orthodox Church in Rose Garden area) – SUCH a well-done festival!! Super authentic, with amazing food, dancing, and darling Greek grandmas. Japanese American Museum – It was really interesting learning about Japanese history in the area, and it was perfect to give my kids some background before we visited an internment camp in Wyoming. Grab lunch in Japantown after. Japanese Friendship Garden – A pretty garden for walking around (although nowhere near as nice as the SF one, I have to say…). Housed within the larger and lovely Kelley Park. Municipal Rose Garden San Jose – A true San Jose gem. Acres of gorgeous blooms and a big field. It’s a test rose garden (like the one in Portland, OR, for instance), meaning they try out some varieties before they’re released to the general public. Peralta Adobe and Fallon House Historic Site (oldest building in San Jose) – I’ve left several voicemails to try to get in here as I can only figure out how they do big tour groups (like for schools), but haven’t been successful. If anyone has an in, please let me know! 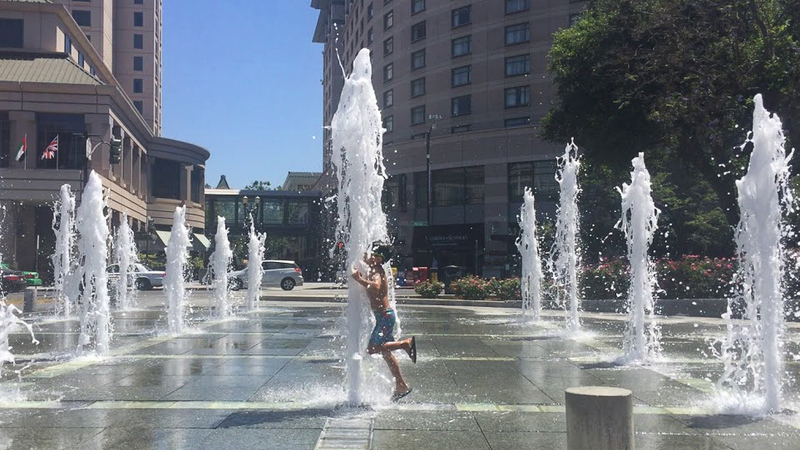 Plaza de Cesar Chavez – There are some fountains that run during the summertime that can be fun for kids. I’d recommend them for slightly older kids, as the fountains spray pretty hard, and there’s no barrier to a busy street. This is also where Christmas in the Park takes place each holiday season. Prevost Ranch & Gardens (Iris Garden open to the public during blooming season April-May) – A gorgeous place to wander around. Not far from the peony farm. Rosicrucian Egyptian Museum – Such an interesting museum with lots of artifacts, including a replica Rosetta Stone. Admission is free for the last hour of the day. Rotary Children’s Play Garden – A fantastic playground for children of all abilities. San Jose Center for the Performing Arts – There’s usually something fun going on here. Symphony Silicon Valley will be playing Harry Potter, and we saw Newsies there. San Jose City Hall – There’s a fun little light display out front through which my kids like running. San Jose Giants minor league baseball game – You can often get free tickets at local grocery stores. Perfect for baseball-loving little ones (for whom you don’t want to buy a seat at a past-bedtime SF game ;)). San Jose History Park – Indoor/outdoor museum of some historic buildings and some small museums (like the Portuguese Historical Museum and the Viet Museum). Be sure to ride an old trolley if you’re there on a weekend! San Jose Institute of Contemporary Art – Fairly small, but has some interesting exhibits that rotate frequently. Free. San Jose Museum of Art – Modern and contemporary art. Not an enormous museum, but a well-curated collection with nice, spacious, well-designed exhibits. San Jose Museum of Quilts and Textiles – Small. They occasionally do little interactive activities for kids. Beautiful fabrics, though. San Pedro Square Market – A super fun indoor area with lots of different food vendors and such. The Neapolitan pizza place here is legit! Santana Row – A cute shopping and eating area that’s fun to walk around or for date night. SAP Center – Home of the Sharks for ice hockey, and they often have other events (such as Disney on Ice). Sierra Vista Open Space Preserve – Nice hiking with beautiful views of the valley. Sikh Gurdwara – The largest gurdwara in North America. St. James Park SJ Jazz Boombox Friday Night Concerts – Open air summer concerts. Tech Museum of Innovation – My favorite museum in San Jose. Tons of interactive exhibits, Body Worlds, and a huge IMAX theater. I wrote a whole post on it here. Trianon Theater – Varied concerts and other performances, including the Mission Chamber Orchestra. Trinity Episcopal Cathedral – The oldest church in San Jose with a fascinating history of rebuilding and service. Willow Glen – A cute area with restaurants and walking. Winchester Mystery House – A kooky old house with lots of secret passageways and fun tours (we went when it was decked out for Christmas).